Toni-Ann Giammona (instructor), New, Old Friend. Watercolor and ink on paper. Lucy Gellman Photo. 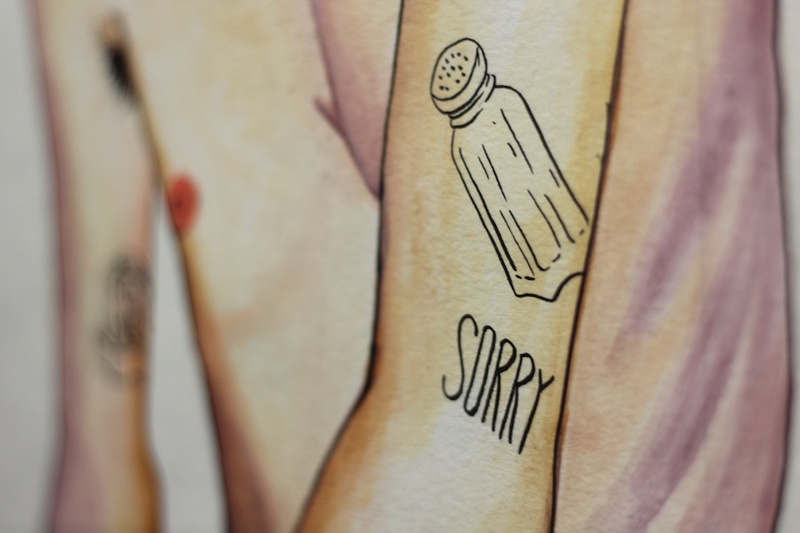 A thin, tattooed bicep is the first thing to catch you, pale skin etched with a salt shaker and the word “SORRY” in spindly letters just above the elbow. Just inches away, Kendrick Lamar lifts his right arm to wave, smiling out at the viewer with big, glossy eyes and a smile that glows beneath his fade. A wall over, a vase of blue roses casts its long shadow across a dining table, one of them so far gone it seems to be hanging its neck in shame. There’s the strong urge to reach out and touch it before it disappears. These are just a few of the images at the downtown branch of the New Haven Free Public Library (NHFPL) this fall, where the Adae Fine Art Academy Student Exhibition 2018 has taken over the Ives Main Gallery for the fourth year in a row. Wednesday night marked the opening reception for the show, which runs through Nov. 9. Information about the academy, located just down Chapel Street in the city’s Ninth Square Historic District, is available in a label for the show and online. Clockwise from top: Adae at the opening reception; Kendrick Lamar by Saturday student Marlee Wright; Kennedy's piece inspires by artist Kate Clark; student Theresa Cappetta with her friend at the opening. 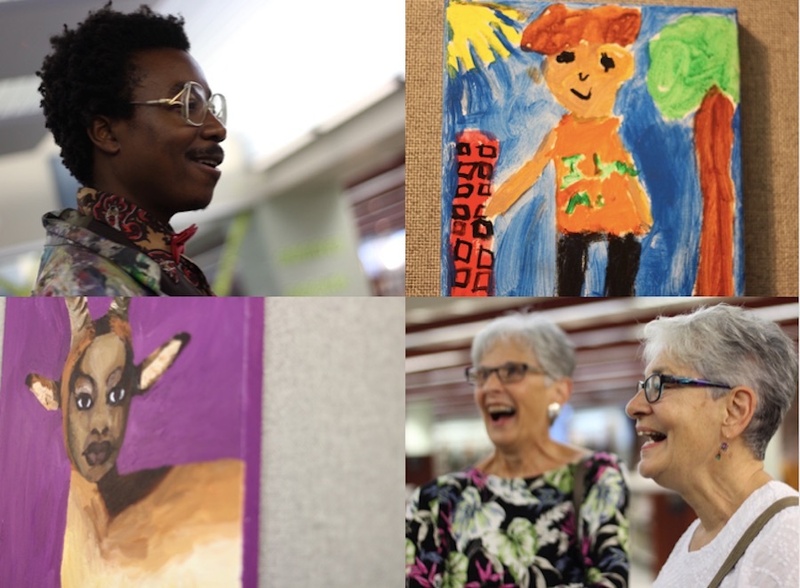 This year, said Adae, the exhibition focuses on work from both his younger (ages seven and up) and adult classes, which both put student- and self-directed learning at their core. It has become something of an annual collaboration for the library, which has hosted the show in the Ives Gallery for several years now, but was partnering with students at the the academy as far back as 2010. Adae said that as a kid growing up in New York, he was lucky to have an art school where he could go to find refuge, and slip into his own artistic niche. In 2005, he created the Adae Fine Art Academy on Chapel Street in that image. Now almost 15 years in, he said he sees that expression as vital to growth and development, especially as visual arts are cut in schools. Julien Sanchez-Levallois' A Righteous Cause. Around the gallery, paintings slide into that outlet, exploring its nooks and crannies and outer limits. There are vivid and abstracted works from young artists, begging the viewer to take a closer look, as well as sharp ones from older students that shift into focus. In one, a body of water glints out from its canvas, paint piled on in sleek, dark strokes. In another, Beatrice Mead’s Sleepy Puss, a sleepy brown cat leans back with heavy-lidded eyes,a soft orange-and-white cotton pillow giving way behind it. 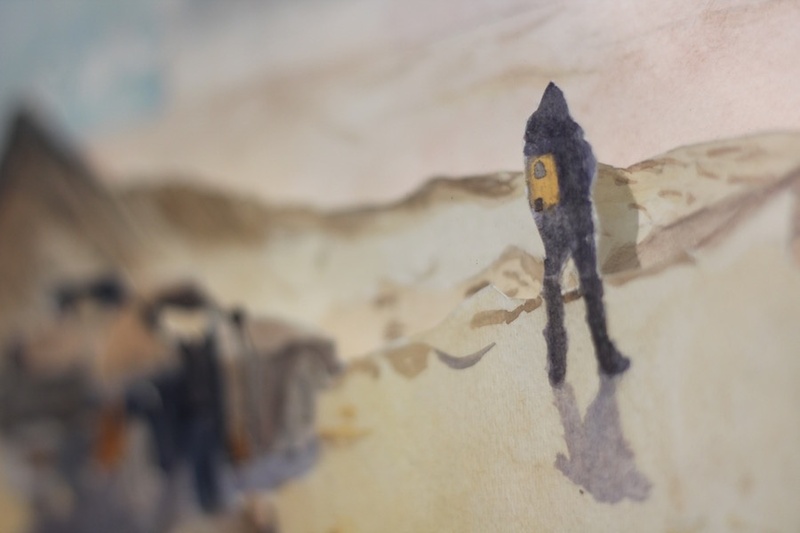 In a third (pictured above), student Julien Sanchez-Levallois layers a watercolor-on-paper landscape, an intrepid explorer making his way through the desert. Mountains and sandy foothills rise before him, brown and pink and a little bit alien. He carries a small yellow backpack that you can almost reach out and touch. A Righteous Cause, the title reads. 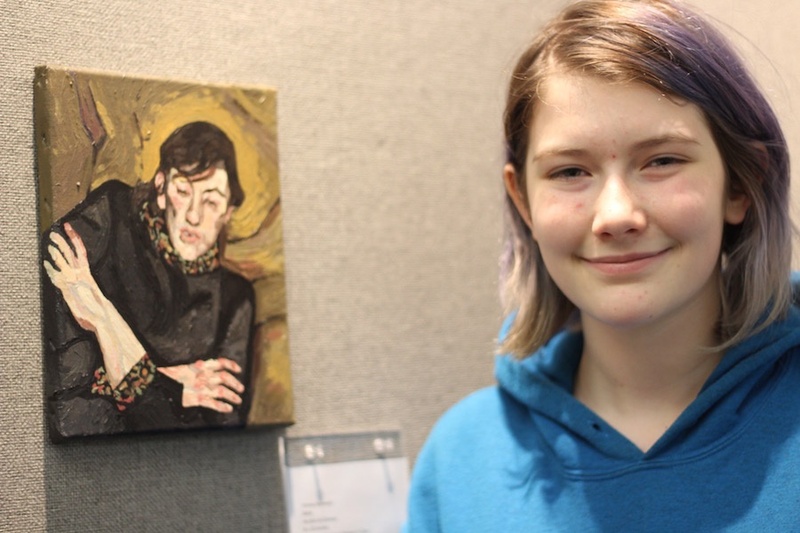 Emma Kennedy with her take on Lucian Freud's Bella. Students have also looked back at art history, paying homage to larger-than-life masters like Donatello, Leonardo and Raphael, as well as more modern giants including Lucian Freud and Alex Katz. In a riff on Freud’s Bella, Saturday morning student Emma Kennedy added a narrower face and halo to a likeness of Freud’s image, honing her skills in acrylic painting with each return to the canvas. 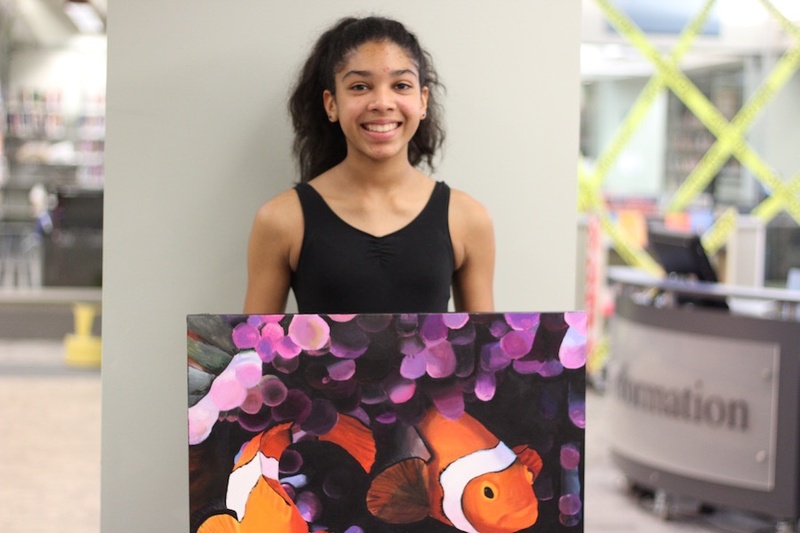 Now a sophomore at the Educational Center for the Arts (ECA), Kennedy said the piece helped her develop patience as an artist, requiring multiple layers before it was done. She motioned to a second piece inspired by Kate Clark, a taxidermy artist who adds human faces and features to her finished pieces She said she’d discovered the artist when Adae handed her a book on taxidermied art to flip through for inspiration. Amanda Lee: I've improved a lot as an artist. Near the tail end of the reception Wednesday night, student Amanda Lee ran in with a painting of clownfish, an image that first caught her eye . An eighth grader at Hamden Middle School, she said she’s grown a lot as an artist since first coming to the academy two years ago. “You made it!” said Adae, his voice delighted even at the edges. He looked around for a free space to hang her piece, consulting with NHFPL staff before moving things around. Lee held the work, a few passers-by taking a look before they walked back up the stairs to the first floor. Then the two turned around, and prepared to hang it up. Adae will formally unveil his Women's Empowerment Mural on the Farmington Canal on Wednesday, Oct. 10 at 10 a.m. The location is at 400 Goodrich St. on the New Haven-Hamden line. To find out more about Adae Fine Art Academy, visit the school's website or check it out on Facebook.